For Collecting Metallic Dust & Debris such as Aluminum and Commercial Alloys. Collects Maximum of 5 lbs. (2.27 kg) of Dust. 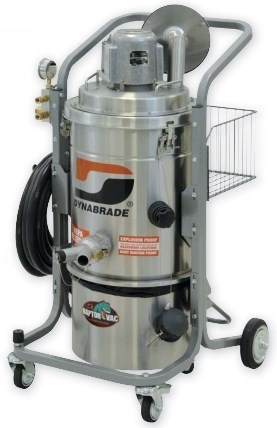 Designed for dry-only source capture, where fine dust must be recovered. Includes HEPA H14 Filter with 99.995% efficiency on 0.3 micron. Filter is located downstream of the motor. Manual Filter Shaker (MFS) system. Top-quality stainless steel body and 6.25 gallon (24 liter) recovery tank. Maximum 5 pounds (2.27 kg) of metal dust recovery. Easy “one click” detaching and connecting of recovery tank! Unit is static-dissipating and conductive.